Known today as Taino, the natives in Hispaniola and Higuey (Cuba) were descendent from South American, Arawak culture, as were the Calusa who occupied the southern peninsula of North America, now called Florida. These tribes were not Amazonian Caribe and thus not warlike or cannibalistic. Both the Taino and the Calusa were relatively peaceful people who struggled to keep their satisfactory social structure alive as well as a respectful relationship with Mother Nature. They resisted the morés of their conquerors whose desire for obedience meant enforcement of a new religion and the destruction of family units through slavery. The Spanish Governor Ovando had authorized a punishment to resistors in Hispaniola. He then sent Conquistador Ponce de León to stop native resistance in Higuey. Both efforts turned into massacres that demoralized the peoples. In Higuey, those who could survive the brutality escaped to remote hills, where today the original Taino culture is still alive. The Florida Calusas did not fare so well, they had lost their singular tribal culture. Today scientific excavations in Florida provide artifacts, which attest to a vibrant past. The Calusa clans lived on Marco Island and in the coastal areas of Naples, Florida; some of these areas are now protected historical sites. Once, over 1,000 tribal members lived at one mound site alone. For over fourteen hundred years, the kingdom of Calusa grew in stature on the Florida peninsula. The clans had a king, and lived according to a familial social order and a naturalist religion. The greatest compounds consisted of a centrally placed, high shell platform where the chief resided. He over-looked a massive, courtyard where members could gather. Smaller shell dwellings encircled the courtyard along with shell walls. The people lived well, mostly from the bounty of the sea, and sometimes from wildlife such as deer, bear or panther. They enjoyed a constant vegetation of various grasses, pine, oak and mangrove. They were adapted to useful lives, building, tending, fishing and creating utilitarian implements or ceremonial art. They worked with deer bone, Whelk Shell and some timber. Family units were of paramount importance to both peoples, Calusa and Taino. The Calusa native culture was extinguished by the 1700's, however, it is likely that some of that era's gene pool descends to certain natives today. The tribes THE MICCOSUKE, as well as THE SEMINOLE maintain certain practices from the past but live in the changing world, trying to succeed economically too. As entrepreneurs in resort development in southwest Florida, they are active in tourism and maintenance of the Florida Everglades. 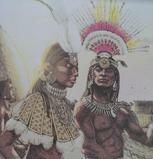 Also a people of peace, The TAINO people have survived colonial expansion and modern intermarriage. They too struggle to maintain their familiar culture, living simply in Cuba with their own hopes for the future. As Passage to Cuba goes to print, embodying reference to each man's heritage, the CUBAN NATION itself labors to enhance the well-being of its citizens economically, yet holding on to its social strengths, and protecting its vital and beautiful, grand island eco-system.